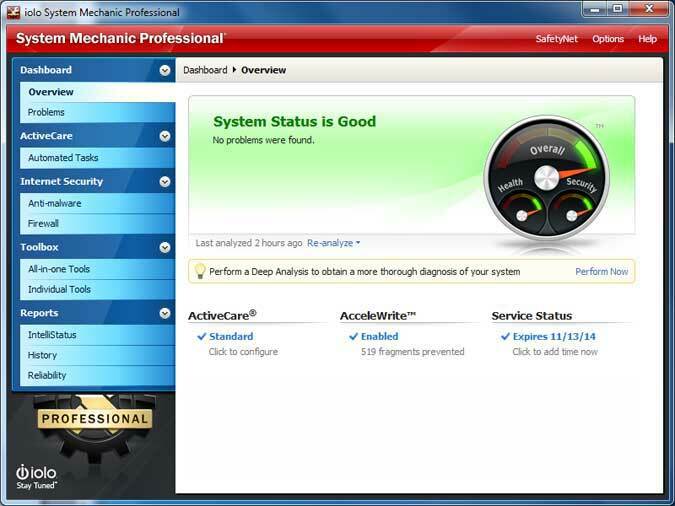 System Mechanic has released a new version and we have been hearing a lot of good things about the new System Mechanic Professional so we thought we would take it for a test drive. 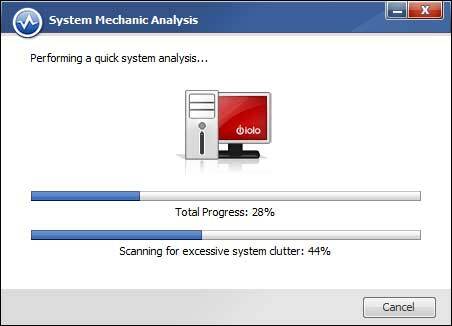 iolo technologies offer two versions of System mechanic. The standard version will fix and speed up your computer by optimizing it for peak performance, repairing problems and errors, cleaning up the system clutter and fixing security vulnerabilities. The Professional version does all of that plus includes some extra goodies. The System Mechanic Professional includes System ShieldANTIVIRUS and Anti-Spyware program, Search and Recover to rescue deleted files and DriverScrubber to secure and erase data from a used hard drive. System Mechanic now offers a service called Whole Home Licensing. While some software companies only allow you to install their products on up to 3 PCs, such restrictions can seem arbitrary and outdated for today’s multi-PC households. With iolo’s industry-first Whole Home Licensing, System Mechanic breaks through the 3-PC restriction to help you fix and speed up each and every one of your household PCs. This innovative new feature makes it easy for you to continue benefiting from System Mechanic’s comprehensive array of performance-tuning services—now delivered with even more value than ever before! See what’s new in System Mechanic 16, featuring PowerSense that monitors your activity in real time and adjusts the PC power levels to deliver maximum performance when needed, Ultra Performance Mode, Endurance Mode, and more. The installation of System Mechanic Professional is pretty straightforward. The choices of programs that come with the professional version are Search and Recover, DriveScrubber, System ShieldANTIVIRUS and are all optional components. This next screen gives you the option to install a gadget that will show real-time system health status. I chose to install the gadget because, quite simply, I like gadgets. 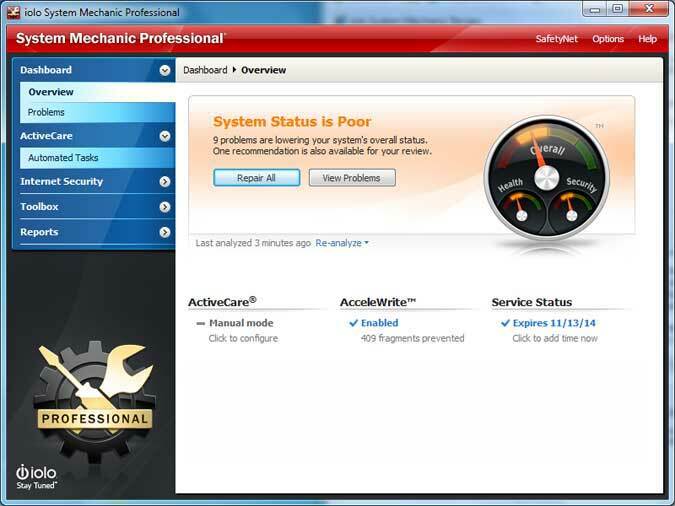 This is the main dashboard that shows a system analysis is required. Not much choice but to hit the analyze now button so I did so. Here is a screen shot of System Mechanic in action doing an initial analysis. I did not want a poor system status so naturally I smacked the repair all button. When it was finished fixing stuff, it told me so with the following summary. 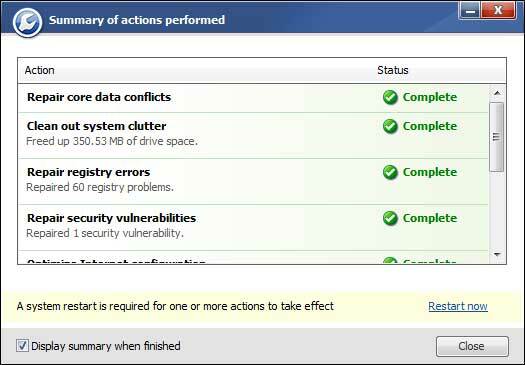 The summary was quite detailed showing how much system clutter it removed, the registry errors it fixed and many more need actions that were performed to keep this PC running smooth. I was also notified that a system restart was required for one or more actions to take affect so I quickly closed this web page and restarted the computer. After the restart, my system status is now good and no problems were found. The program also has what is called a SafetyNet that allows you to review or roll-back any changes made to the system which is a nice feature to have in case something should go awry. The optimization part of the utility is just the beginning of the things System Mechanic is capable of doing. 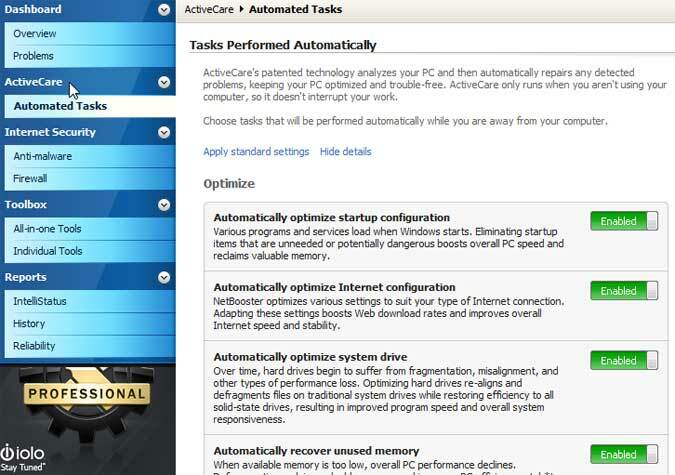 The ActiveCare portion of the program is a patented technology that analyzes your PC and then automatically repairs any detected problems, keeping your PC optimized and trouble-free. ActiveCare only runs when you are not using your computer so it will not interrupt your work and you can enable or disable the tasks that will be performed automatically. I chose to apply the standard setting that System Mechanic recommended. 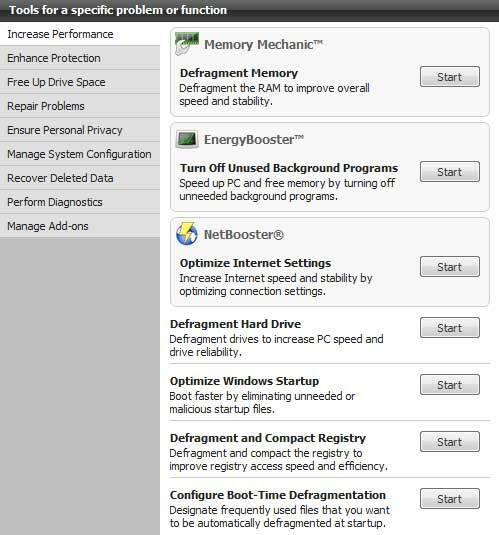 If you would rather optimize and enhance individual computer performance settings, System Mechanic gives you that option. There is also an Internet Security section that uses iolo’s System Shield as a defense against spyware and viruses. There is also a Toolbox that is full of all kinds of power tools for the geek in all of us. 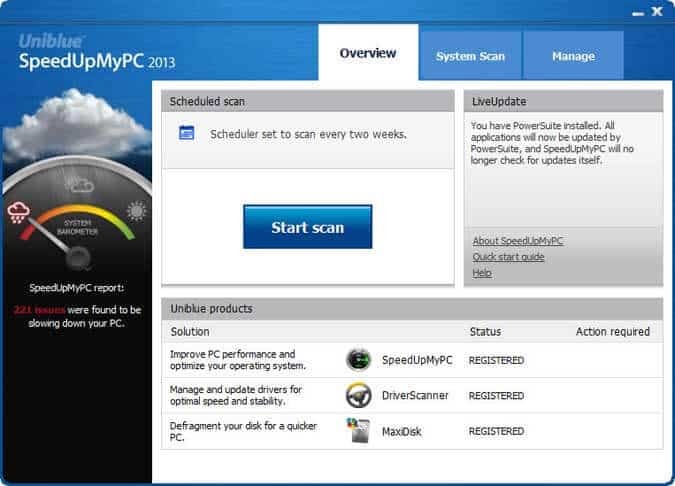 There is a PC Accelerator that supercharges Windows by up to 300%, a PC Repair Wizard to repair frustrating and mysterious errors, PC Cleanup and a PC Security are other tools available. The System Mechanic computer optimization utility looks like a solid program to keep you computer running at its peak performance. 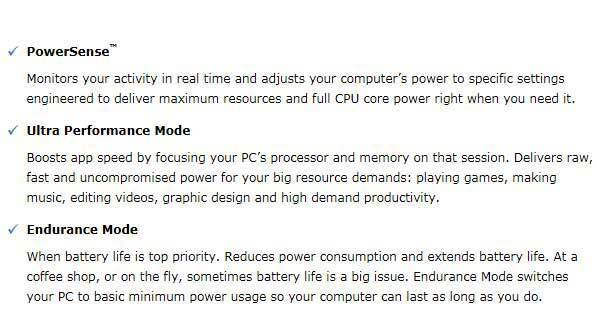 It is an easy to use program made for the novice computer user with some great power tools to satisfy the power users. This is a recommended computer optimization utility to have in your toolbox. Iolo Technologies offers two versions of the computer optimization utility; System Mechanic 16 and System Mechanic Professional 15 to keep all of the computers running at their best with very little work on your part. System Mechanic 16 has been released with lots of advancements in computer optimization and protection. 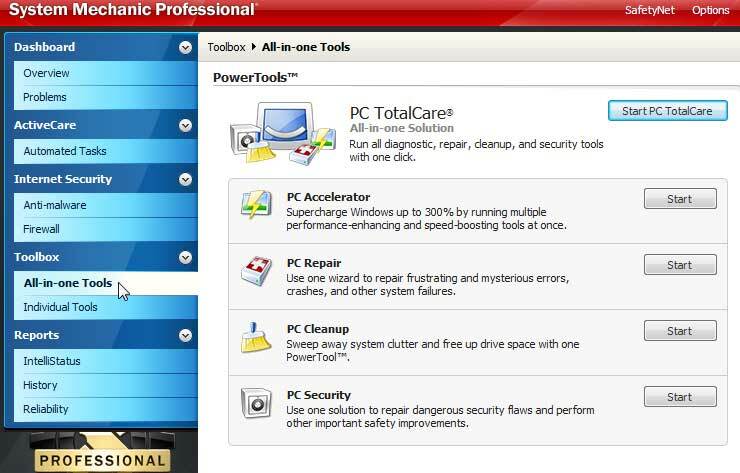 System Mechanic Professional 15 combines several potent products to speed up and secure your computer, offering total computer care in a single package that includes every utility your PC will need to keep it secure and running at an optimized level. Included is a full version of System Mechanic, the world’s best selling computer optimization software. Data security features include fullANTIVIRUS and firewall protection, true data recovery to restore lost or deleted files, and military-standard drive scrubbing. 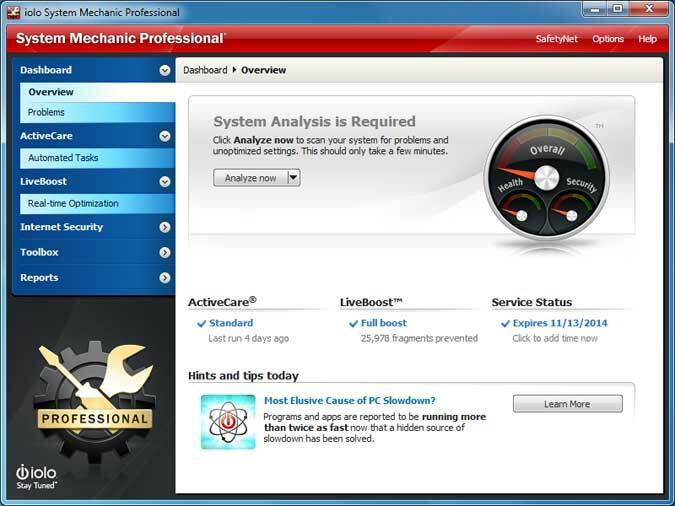 Read more about System Mechanic Professional. The tools included in the System Mechanic 16 computer optimization program will allow you to enjoy that “New Computer” feeling again. This utility automatically repairs errors and fragmentation, cleans out clutter, and tunes up your computer so that it runs smoothly, reliably, and up to 300% faster! 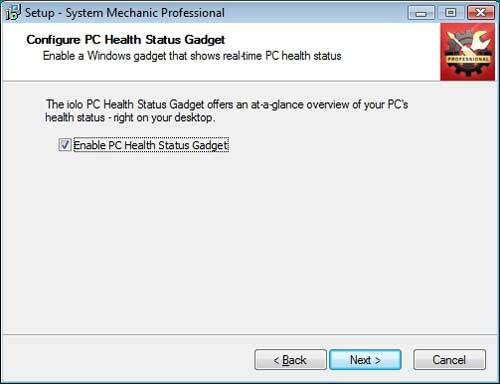 The iolo Technologies System MechanicREPAIRS WINDOWS REGISTRY errors and hard drive problems with ActiveCare Technology.